The other day I told you how my old Craftsman table saw died mid-project and I had to fork out the big buckers for a new table saw. Well… as it turns out, table saws (with a table attached) are almost twice the price of “job site” table saws (those with no table attached). We’re talking a $429 portable job site table saw versus a $799 one with a stand. That’s hefty for what is basically the same saw. The downside is that without an actual stand for it, I have to cut my wood on the ground and it just doesn’t feel safe. I surfed for table saw plans online and came across a build by Nikki @grainsofgrace.stl on Instagram. She very generously shared her plans with me and I modified them to create a smaller version of her table saw stand. I bought (6) 2x4x8 boards and one sheet of 3/4″ mdf for my build. You’ll also want (4) 2″ locking castors. 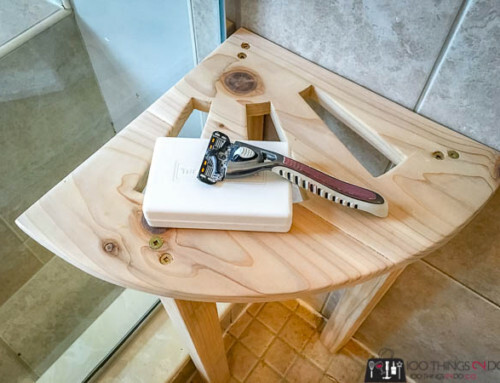 I made all of my cuts on my mitre saw and then pre-drilled pocket holes on the 21 ½”, 23″ and 17″ boards. Using wood glue and 2 ½” pocket screws create two rectangles from your 35 ¼” and 23″ boards – check for square with a speed square. This is the upper level of your table saw stand, now you will attach the lower level which will hold the table saw itself. 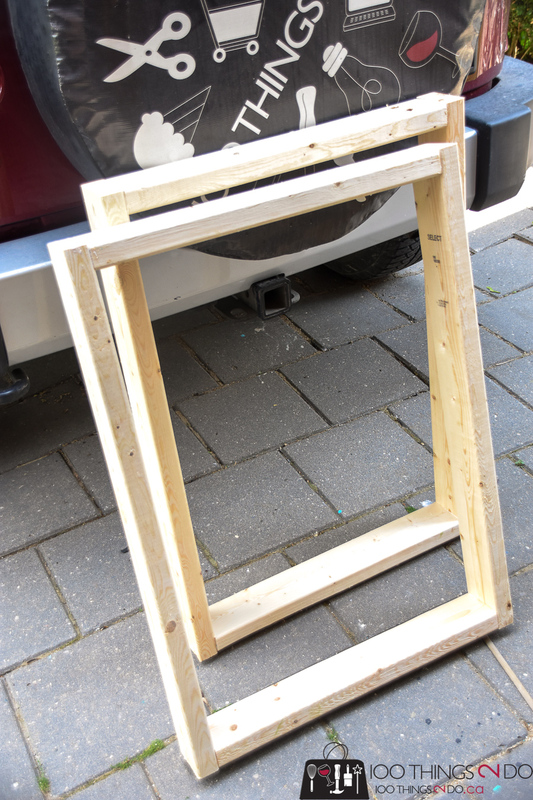 To the bottom of your frame, attach your 21 ½” boards with wood glue and 2 ½” pocket screws. Continue building your frame for both sides before bringing in your 17″ boards to connect everything. Below is a view of my table saw stand tipped on its side. Once your framework is complete, attach your locking castors with 2 ½” construction screws for rigidity. Lift your table saw stand to upright. The top sections of your table saw stand will be cut from the 24″ mdf boards – one 23″ long and the other 26″ long. I used my new table saw to help build the new table saw stand – I feel like I should sing Alannis Morrissette’s “Ironic” here. I attached the tops with 2″ deck screws. I’ve checked and re-checked and my building plans for a table saw stand are accurate – BUT, once I assembled mine I found that I had a 1/8″ difference between the table top of the saw and the top-level of the stand. At this point, any wood that I slide over my table saw will bump against the top-level of the stand and that can be both annoying and dangerous. To make up for this 1/8″ builder’s error (not building plan error), I added a shim underneath the mdf board on the table saw level. Now it’s perfect and safe. Attach your lower shelf pieces by pre-cutting notches in your mdf boards for the 2×4’s. I took a scrap piece of 2×4 and traced it onto each corner and then cut with a jig saw. 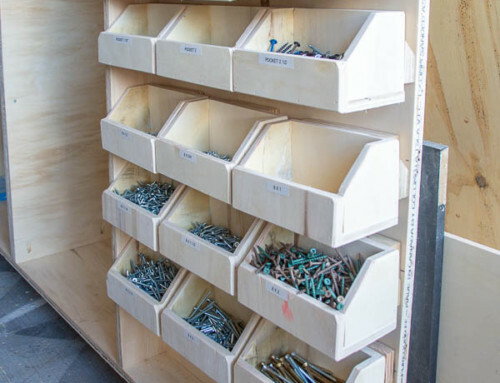 Screw into place with 2″ wood screws. The shelving section of the building plans for a table saw stand are left up to you. 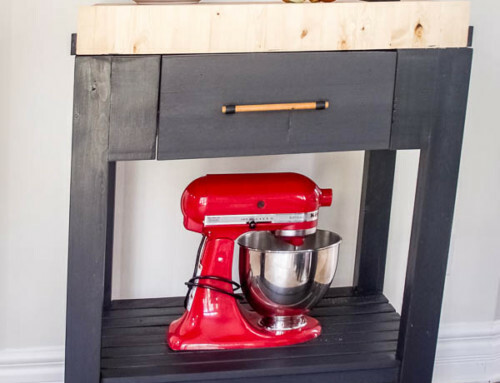 Do you have large tools you want to store underneath like a drill press or a planer? 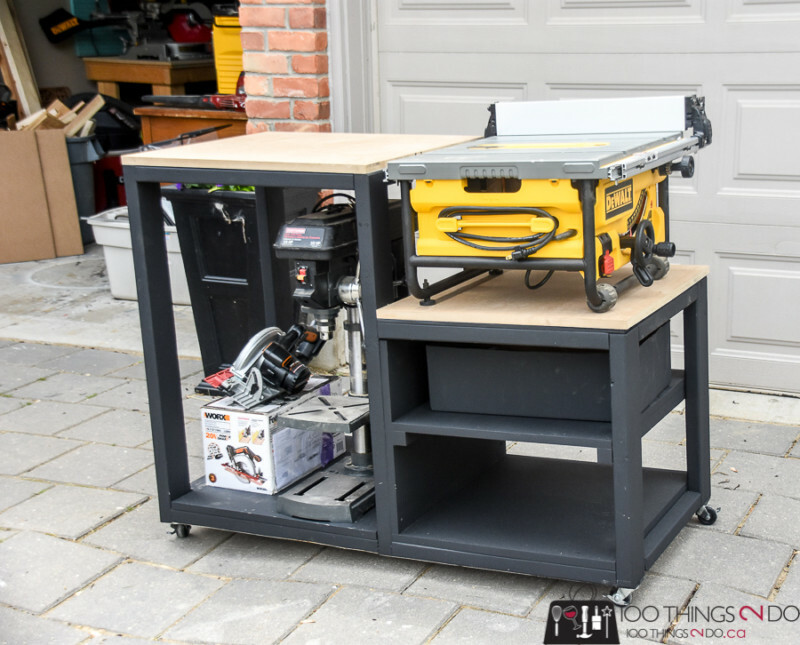 The larger opening underneath the stand is also roomy enough to fit a shop vac which you can attach to the back of your table saw itself. I added a simple shelf underneath the table saw using bits of scrap wood with mdf laid over. I didn’t glue these in place so that I can change them down the road if I need more or less space. I also added a piece of mdf to back the lower shelves to keep some of the sawdust from getting in. I don’t have a use for the bottom shelf just yet, but I know I’ll fill it. The back section would also be great with pegboard inserted that you could hang tools and/or blades on. 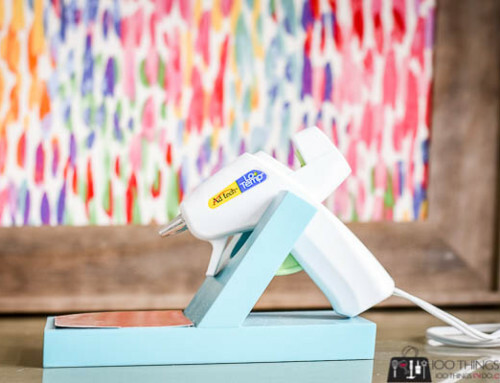 The saw is spectacular and now it has a spectacular (and portable) home in my she-shop! is 13 1/4″ from bottom to table height. I’d better go paint my workbench now so that is equally as badass. I hope this sounds more constructive than critical. You should have followed the Nikki’s original plans closer. 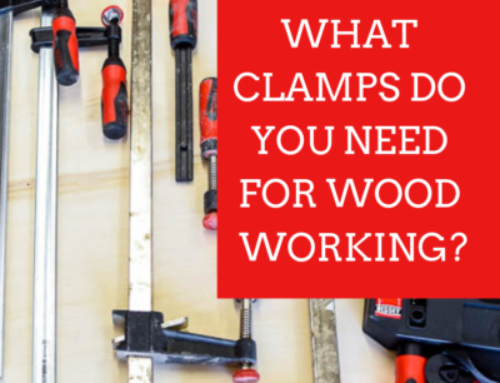 In an effort to simplify her plans, you lost a lot of strength a workbench should have. It had 2x4s on edge with plywood on top of the base to create a torsion box for the base of the bench. Your plan is very weak on the middle and is already visibly sagging in your pictures. Not to mention the four 2x4s meeting at one point in the middle of the bottom is very poor woodworking technique you should not be teaching people. You should fix this plan or take it down. Don’t make woodworking plans if you don’t know proper woodworking techniques. Or make friends with a local cabinet maker and coordinate your plans with them. You’re probably right – I am a self-taught DIY blogger sharing FREE plans expecting nothing in return. My build works, is solid and stable and serves the function it was built for. Please feel free to not use my plans, I’m sorry if you felt ‘forced’. Your constructive criticism is appreciated – your bitchiness is not. I didn’t follow the plans 100% accurately, because I don’t have a pocket hole jig. Instead, i added a couple extra boards to screw into perpendicular to the frame. It added a bit of extra weight, but this thing is solid as a rock. Appreciate the plans, even though I deviated a bit. Now I want that pocket hole jig even more! So glad you tried it and that it’s working for you! Don’t worry about a pocket-hole jig – it’s a “nice to have” but not a “need to have” and I’m sure your project is spectacular without it! Thanks for commenting! Would you be able to share your Sketchup plans too?